Sampath Bank was recognized as one of Sri Lanka’s Top Ten Corporate Citizens of the year at the Best Corporate Citizen Sustainability Award 2018 held at the Cinnamon Grand, Colombo recently. The Bank was also adjudged the joint winner of the category award for Governance at this forum which seeks to identify and honor champions of sustainability in Sri Lanka’s corporate sector. 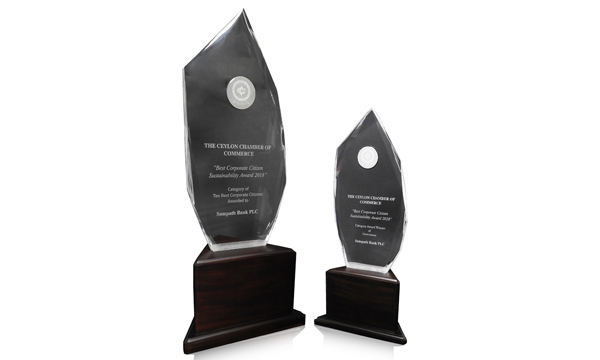 Being held for the 15th consecutive year, the Best Corporate Citizen Sustainability Awards are presented by the Ceylon Chamber of Commerce and are regarded as the highest honor that a corporate entity can earn in Sri Lanka for its “Higher State of Corporate Excellence”. Mrs. Shashi Kandambi Jassim, Senior Deputy General Manager - Corporate Banking, Sampath Bank PLC and Mr. Aruna Jayasekera, Group Chief Human Resource Officer, Sampath Bank PLC accepted the awards on behalf of the Bank amidst a gathering of 350 distinguished corporate executives. The accolades received at this forum are a further testament to Sampath Bank’s commitment to the principles of triple bottom line and towards extending its support to help the nation achieve the UN Sustainable Development Goals. It continues to deliver greater economic value to all stakeholders through its innovative banking solutions and focus on customers. The Bank also places equal emphasis on people and the planet. It leverages advances in technology to rollout pathbreaking solutions such as Sampath Slipless banking aimed at minimizing the impact on the environment whilst dialing up customer convenience. Sampath Bank also has a host of community outreach initiatives that cater to the specific needs of different segments of society, touching everyone from students, women and the youth to farmers and SMEs. The Bank’s Sampath Saviya entrepreneurship development program supports young adults, women and SMEs to reduce poverty and drive economic growth. Restoring tanks in the country’s dry zone, the Sampath Wewata Jeewayak initiative seeks to empower agri-entrepreneurs and thereby, help develop the rural economy. The Bank also nurtures and recognizes budding green inventors from state and private universities and green entrepreneurs involved in the development of sustainable eco-friendly solutions through its national-level, annual Sampath Green Inventor competition. Helping underprivileged students better prepare for the Grade 5 Scholarship exams, the Sampath Bank “Pahe Shishyathwa” seminar series focuses on enhancing the confidence levels of both the children and their parents. “While we will continue to support communities through these initiatives, we are gradually transforming ourselves into a truly sustainable business wherein addressing societal and environmental issues and achieving financial success go hand-in-hand,” added Mr. Fernando. Sampath Bank continues to win several awards and accolades for its commitment to excellence, both locally and around the world. The Bank was rated as one of Sri Lanka’s best performing companies at the Business Today Top 30 Awards 2017 – 2018, moving up two places to be ranked fifth this year. It was also recognized as the country’s ‘Best Retail Bank’ and ‘Best Commercial Bank’ at the prestigious World Finance Banking Awards for the 5th consecutive year. Established in 1987, Sampath Bank has become a state-of-the-art financial institution that continues to be a market leader today thanks to its constant innovation and customer focused approach to business. Its unique tailor-made solutions, superior services and convenience of access have allowed Sampath Bank to further differentiate itself from the competition and stand out as the bank of choice for many in Sri Lanka.